In one corner you have the heavyweight, Google Maps, with a seven-year head start and a vast amount of data. In the other corner you have the underdog with a very big bank account, Apple Maps. Round one begins with the iPhone 5 – loaded with iOS 6 – removing all traces of Google Maps and replacing it with Apple Maps. So how do they compare? Make no mistake. Maps for iOS 6 is a great achievement for Apple. Starting from basically a blank slate and making some strategic acquisitions and partnerships (TomTom, Placebase, C3, Poly9, Waze) in map data, POI information and 3D fly-over images, Maps is amazing for what it does. On the other hand, comparing it to Google Maps, which has been around since 2004 and leverages the company’s experience and expertise in mapping, is going to leave Apple coming up short. 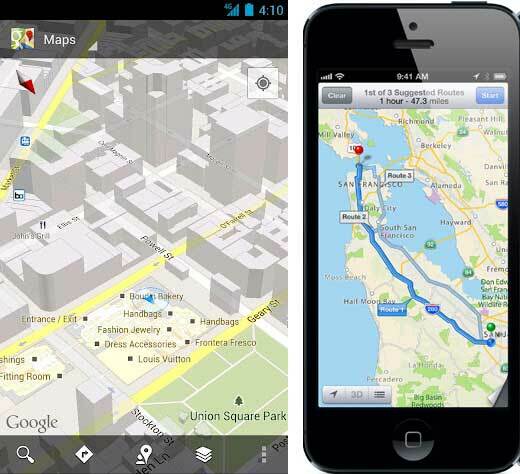 There are many new features getting introduced in the iOS 6 version of the Maps app, such as turn-by-turn navigation and a new “flyover” mode. But already many reviewers are missing the one thing that the new Maps doesn’t have: Google Maps data. Instead, Apple’s mapping data is coming from vendors TomTom and Waze, with search data tied in to the Yelp location-based review service. And the new dataset may not just be lacking a little – there could be big gaps. Which makes this a feature and data war. Who will have the best turn-by-turn navigation and the most useful innovation. And how will Apple complete their data set without using Google’s, which they have sworn to never use. The Google Maps for Android app (update) will make it easier to search for places on Android phones and personalize searches on maps. (It will also) sync across devices. Say you are making lunch plans and you search for a restaurant on your computer. Later, you pull out your phone to look up its location on Google Maps. If you were logged in to Google on your desktop computer earlier it will suggest the restaurant. The battle begins with Google far ahead in terms of features and data, but Apple always has a strategy for winning and it usually involves a liberal arts twist. We can expect Google to continue its rapid improvement of Google Maps, like a car accelerating downhill. While Apple goes slowly uphill, working out the bugs in release one, then updating twice a year at their hardware and software Keynotes in September and January.